With two predecessors in its wake, Magic: The Gathering - Duels of the Planeswalkers 2013 is the third installment to hit Xbox Live Arcade, iPad, Steam, and the PlayStation Network. The DotP series has generally been known for pulling long-lost Magic players back into the game while also picking up some newbies like me along the way. This is largely due to the game’s ability to take care of every manual aspect of a Magic tournament in real life – counting, shuffling, placing counters, and defining attributes on the spot can go a long way in pleasing a Magic player. I’ve spent my entire Magic career growing up on the DotP series for XBLA so needless to say I had some standards and small expectations in place before coming into this. Although the DotP series has been successful in creating an overall smooth and easy-to-pick-up Magic platform, there were a few necessary tweaks that I’ve been keeping my eye on. They say third time’s a charm -- and they may have been right. DotP 2013 features the same general interface as the 2012 version but with some new artwork and a few added tweaks. A new Player Status option can be found in the main menu which displays historical information on your character and allows you to choose from unlockable personas without digging into the options tab. Players can also browse through achievements, leaderboard information, and a neat mana statistics bar within this menu. The Deck Manager now shows stats on the amount of creatures vs other types of cards, and stacks them in a neat display. However, the ability to customize decks is still very limited – players are only able to remove cards other than mana, therefore leaving mana to be dished out on a sliding scale. 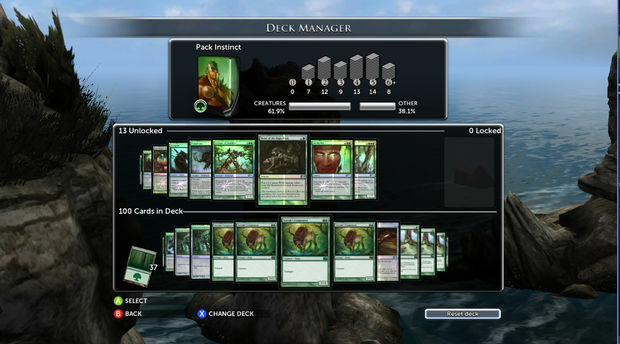 DotP 2013 contains 10 decks total to unlock, which are similar to the ones featured in DotP 2012 but with more streamlining. For example, there are very few decks that contain more than one type of mana, and most of the decks contain a medallion card that decreases the cost of mana for a particular color. Although the decks are a bit simpler, the gameplay is still challenging and there are still plenty of new cards to enjoy. Some of the builds are event a bit surprising, such as Jace's Dream Puppets deck. When selecting a particular deck for battle, stats appear with attributes such as Creature Size, Card Synergy, and Deck Speed and Flexibility for ease of comparison against other builds. The Campaign in DotP 2013 has distanced itself from the tree-branch method and instead separates itself into various realms within Magic lore. Within these realms the game progresses linearly with battles called Encounters – these are meant for the player to devise strategies against a certain type of card, or battle. For example, the first Encounter has you fighting off hoards of flying Suntail Hawks in order for you to develop a method of defense against flying creatures in battle. These encounters eventually lead to boss battles, dueling against full-fledged Planeswalkers as in previous iterations. They now flaunt animations and character descriptions including history, stats, and relations to other Planeswalkers for story purposes. 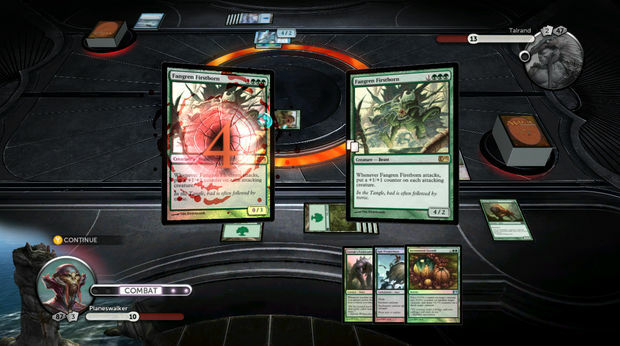 Revenge mode is still on the slate, which gives players the opportunity to duel against the Planeswalkers one last time in a harder difficulty setting. Challenges are also still present, however they’re off in their own section as they were in the first DotP. Rather than keeping the physical Magic card game advertising to the loading screens as they’ve done in the past, ads are now placed straight into the Campaign. Once a player beats a high-profile Planeswalker, they’ll find an advertisement for that deck pop up with a link of information on how to buy it. The ads are later stored in the “Extras” section on the menu. It’s a minor annoyance, but one that’s noticed. The most notable change is the absence of Archenemy mode, with Planechase in its stead. Archenemy was a much loved (although highly frustrating) addition to DotP 2012 and it is missed, but its exclusion is not surprising. Wizards of the Coast prides itself in creating a new game experience with each DotP, and they’ve certainly crafted a very different mode here. In Planechase, a player can duel against 1-3 other Planeswalkers as they normally would in a game, with the addition of Planar cards depicting the different realms of Magic along with a set of conditions. These conditions can range from anything from adding mana to a player’s pool, to not allowing creatures to attack. Setting off the conditions, or changing out the planar cards (also known as planeswalking) is all determined by the roll of a die. The different configuration that Planechase offers is admirable, but it seems to fall short in areas. 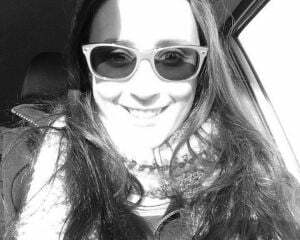 The chance factor that it presents is exciting at first but can become irritating after a time. Games tend to run on for an extremely long amount of time as the cards defy most Magic logic and often reset conditions which can make players extremely powerful in a short period of time, creating a stand-off environment -- or in the reverse case, having players start from square one. The random chance factor seems to override the skill of playing Magic. Overall, it’s a solid mode, but not the most memorable. Probably considered the most improved feature in DotP is the ability to manually tap mana. Gone are the days of pulling out hair in frustration when the game decided to choose the wrong mana to tap, leaving your next move completely doomed. The cost of mana is also highlighted when selecting a card, making it visually easy for the player to determine how much would be spent. Graveyard browsing is also much easier this time around, allowing the player to select their own or an opponent’s graveyard with the click of a button. Multiplayer touts the same options as other DotP iterations -- Two Headed Giant (2v2), Free-for-all (up to four players against one another), and Planechase (instead of Archenemy). The menus and lobbies are no different than before, but then again there wasn’t much to improve on in that respect. Loading times seem reasonable, and there are a plethora of random internet people to play against as there always has been with DotP. 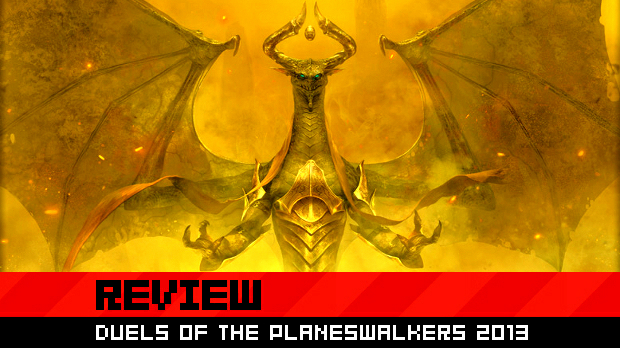 Duels of the Planeswalkers 2013 is an admirable attempt at creating the ideal gaming platform for Magic -- fans of the DotP series will be pleased, but not entirely blown away. 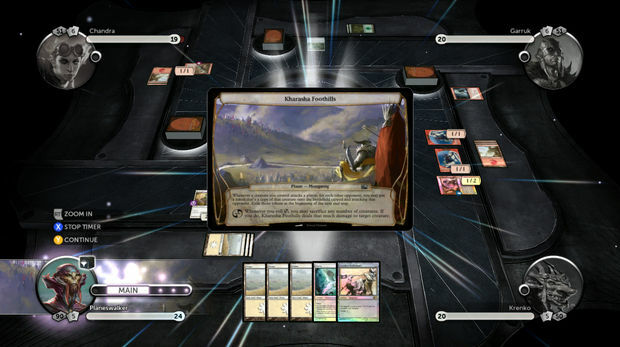 The hindrances present in prior editions have been removed, and basic improvements to the interface have ultimately paid off, making this game a practical and perfect rendition of the physical card game. Although the decks are a bit simpler than I'd prefer, they're still highly enjoyable and interesting enough to capture my attention throughout the game. Planechase is no Archenemy, but it's still a valiant effort in creating a unique game mode that will excite most players. Overall, new features like the stat boards, the Lord of the Rings-esque music, and the ability to tap mana have won me over, making this third edition a charm.